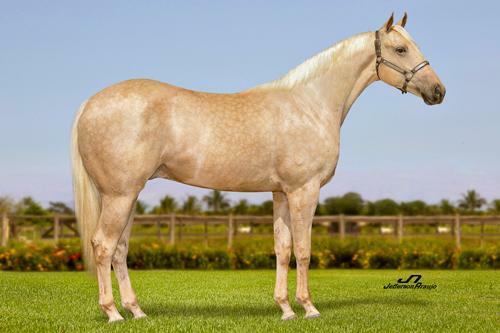 SUA MÁE, A IMPORTADA E FANTÁSTICA GRAY GOOSE COM O PEDIGREE MATERNO QUE VEM DO SANGUE DE FIRST DOWN DASH NA LINHDA SUPERIOR E NA LINHA BAIXA O MESMO PEDIGREE DE MISS FORTUNES FOOL. FINER WAVES, 3,5 pts. Res. Camp. 5ª Etapa 15º Circuito Costa Oeste CCOCT - 2014 Três Tambores - Aberta ? Exibição. 4ºL. 2 etapa do Circuito Amigos do Paraná Três Tambores - Aberta ? Exibição. SI 104, AQHA Racing Champion Three-year-old Colt, AQHA Racing Champion Three-year-old, World Champion Racing American QH, 1st-Los Alamitos Super Derby(G1), 1st-Champion of Champions(G1), 1st-Governor's Cup Derby(G2), 1st-Los Alamitos Million Juvenile Invitational(G3), 2nd-Golden State Million Futurity(G1), 2nd-Golden State Derby(G1), 2nd-Los Alamitos Winter Derby(G1), Finalist in Ed Burke Memorial Million Futurity S.(G1), Finalist in Governor's Cup Futurity(G1). Dash for Cash Fut.­G2, Las Damas H.­G2. PRODUTORA DE us$ 3 , 7 MILHÕES. Alamitos Million Fut­G1, Golden State Million Fut­G1, Governor's Cup Fut­G1, Champion of Champions­G1, PCQHRA Breeders Derby­G2, etc. Reprodutor. Derby­G2, 2o. Golden State Million Fut.­G1, Golden State Derby­G1, etc. Reprodutor. * AQUAFINA AAA­99 (First Down Dash). 4 vitórias, $ 188,336, 1º Los Alamitos Derby Challenge, 3o. Houston Fut.­G1, etc. * LITTLE SURFER AAAT­104 (First Down Dash). 5 vitórias, $ 102,749, 1o. Hialeah Derby(em recorde), Lone Star Distaff Chlg., etc. * WHIP CURL AAA­96 (Carters Cartel). 3 vitórias, $ 24,853, 1º Sandy Downs Distaff Challenge. * Sir Runaway Dash AAA­97 (First Down Dash). 4 vitórias, $ 120,706, 2o. Golden State D.­G1, Finalista Governor's Cup Fut­G1, etc. * Bring the Bling AAA­97 (First Down Dash). 2 vitórias, $ 67,320, 2o. El Primero Del Ano Derby­G2, 3o. Farnam S., etc.